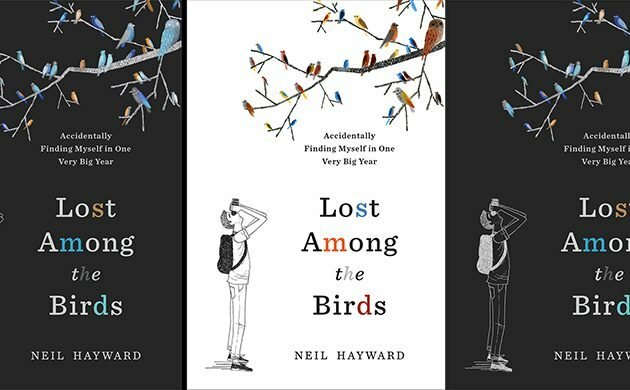 Lost Among the Birds: Accidentally Finding Myself in One Very Big Year is Neil Hayward’s story of his Big Year, and it is well worth the read. Written in Hayward’s self-ironic yet disarmingly friendly style, this is an absorbing memoir and Big Year book. Hayward smartly re-crafts the birding adventures related in his Accidental Big Year blog to create a different kind of narrative. The blog focused on finding the bird and seeing the bird. The book tells about these quests within the framework of Hayward’s personal journey—the depression that had him seeing the world in shades of gray, his developing relationship with girlfriend Gerri Buck, and the surprising ways in which his birding obsession made his life whole. I feel like I should erase that last sentence, that reading that this book is partly about personal feelings will send some birders screaming for the hills. Please—don’t do that! This is one of the best narrative birding books I’ve read in recent years (as in not a field guide or reference book), an outstanding title in the very specific Big Year genre. Hayward, a 39-year old Brit who relocated to Massachusetts for work reasons and stayed, even developing a love of baseball (his Red Sox hat was famously one of his field marks in 2013), started his Big Year late. But, even if he wasn’t birding strategically from the minute the clock struck midnight on January 1, 2013, it’s pretty obvious from the beginning that birding like a maniac is his way of life for the near future. He travels to Arizona in mid-January to find Nutting’s Flycatcher, and then to Vancouver at the end of January for Red-flanked Bluetail and Brambling, followed immediately by a pelagic that brings sightings of Black-footed Albatross, Ancient Murrelets, and Cassin’s Auklets, and then somehow ends up in an alley in Calgary in February, with Gerri, looking—and finding—Gray Partridge. By the end of February, Hayward has seen 294 birds in five states and two provinces. On April 25, with 492 birds on his year list, he finally commits to doing a Big Year! The chapter titles, one for each year, thankfully change from downers like “The Bluebirds of Unhappiness” to the knowingly corny (“Winning the Booby Prize” wins the prize). And, though we know the end in advance, a certain kind of suspense takes over the narrative. Year list totals at the end of each chapter are now followed by John Vanderpoel’s comparable bird count (Vanderpoel’s 2011 Big Year totaled 743 birds and his bird list supplied inspiration and a partial blueprint for Hayward). Supporting characters like Jay Lehman and Chris Hitt, big year birders present and past, start making more frequent appearances. And, the birds and birding trips to Arizona, Florida, California, the waters of North Carolina, and Alaska—always back to Alaska—start accumulating. This is what we want from a Big Year Book—crazy birding adventures, crazy birders met along the way, discussions of birding strategy both in the long term and immediate choices, a bit of history about big years and the storied members of the 700 club, challenges and annoyances (exactly how many times did Hayward sleep in his rental car? ), low points and highs. Hayward smartly does not write about every single bird he saw, and even skips over some of his trips. The selectivity allows for better story telling. I particularly enjoyed Hayward’s observations of birders, and was happy to see birders I knew through social media, birding books, and even in real life, described with his sharp but ultimately kind eye. There’s Doug Gochfeld, “an exceptional birder from New York” whose “short, dark hair was slowly overtaking his face,” one of Hayward’s guides on St. Paul’s Island. John Puschock, the man who knows how to find Ross’s Gulls in Barrow, has “a grin and eyebrow permanently set to sarcastic” and a “calm, self-deprecating demeanor [that] clearly hid a cunning and logical mind.” Even Sandy Komito makes an appearance, meeting Hayward on one of his Shearwater pelagics and giving him sage advice: Go for the rarities. I am happy to see an index that is quite thorough in coverage, including the many friends and birders who make appearances as well as birds, places, and personal events. It seems very appropriate that “life birds” is followed by “life decisions” and then “life lists.” I am disappointed that there are no photographs. The bird drawings at the start of each chapter are charming, but they are no substitute for the photos that illustrated each blog entry. I do adore the cover drawing by Julie Morstad. But, at the very least, I do think there should have been a photo of Neil and Gerri, preferably birding! Finally, some thoughts about Hayward’s depiction of his personal journey: It’s a shock to read at the beginning of Chapter 3 (yes, The Bluebirds of Unhappiness chapter) that Hayward isn’t just grousing about life like most of us. He is clinically depressed, and his description of how that disease altered his life is affecting and courageous. And, though he states he doesn’t know if it is his anti-depression medication or the birds that give him the ability to see a future for himself and for his relationship with Gerri, it is refreshing to read a birding memoir that doesn’t simplistically give all the credit to birding. I also think that Gerri, now Gerri Hayward, must be a saint related to Odysseus’s Penelope. I thank her for allowing Neil to include her in his narrative. There were times when I found Hayward’s comments on his personal state of mind distracting and repetitive, other times when his writing is lyrical, especially as the depression starts to lift. I think it takes a lot of guts to be so open in a genre that generally downplays anything but birds. Lost Among the Birds: Accidentally Finding Myself in One Very Big Year is a story of reluctant ambition, birding adventure, obsession tempered by introspection, friendships forged in alien, freezing landscapes, and a relationship that grows both in spite of and because of birding. Like all good Big Year books, it is also a roadmap for that big year in every birder’s fantasy. I know birders will thoroughly enjoy this book. Is this is a book for the general public? I honestly don’t know. I think, with Hayward’s wit and honesty, it has a chance. *Technically, Hayward ended 2013 with 747 ABA birds and 3 provisional birds. He tied Komito’s record officially in 2014, when the ABA Checklist Committee approved the addition of the Common Redstart seen on St. Paul’s Island, and surpassed it in June 2015—signed, sealed and delivered by the ABA Checklist Committee, with their approval of bird #249, Rufous-necked Wood-Rail. Neil Hayward. Lost Among the Birds: Accidentally Finding Myself in One Very Big Year. Bloomsbury USA, June 2016. 416p. $28; also available in Kindle ($9.59) and eBook ($11.99) formats. What an exceptional review! I will get it on the ASAP!